Just as Mack limits the number of speaking engagements he takes on, he will only accept 4 webinar proposals in 2017. Focusing his attention allows him to spend more time on the design and creation of your webinar, and more time helping you to promote the event. 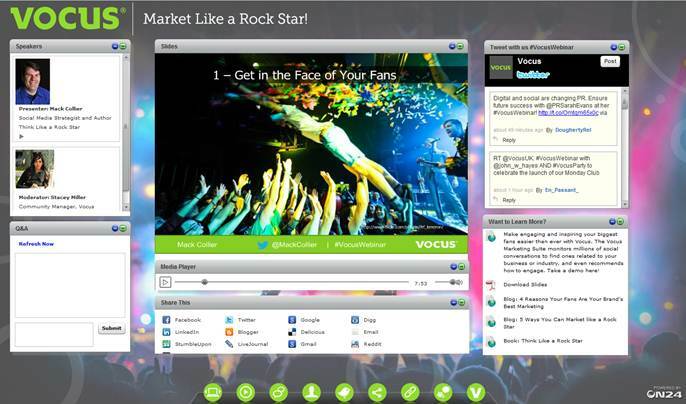 Mack began using this approach in 2014, giving just 2 webinars, one for Vocus Marketing (now OutMarket) and the other for MarketingProfs PRO. The webinars were 5 months apart, allowing Mack plenty of time to create custom content and help his clients promote their events. Mack pre-records his webinars with the Rode Podcaster dynamic microphone. The Rode Podcaster is world-renown as one of the best dynamic microphones on the market, and is a favorite among professional podcasters as well as media. 1 – Live technical snafus by the speaker are eliminated. This is a common problem with live webinars, if the speaker has an issue from their end, the host is basically helpless to correct the problem. It degrades the attendee experience and reflects negatively on your company. Mack eliminates these issues by sending you a pre-recorded video of the webinar. 2 – The quality and delivery of the webinar is greatly enhanced. Since Mack is recording the webinar beforehand, he can edit and correct any delivery issues so the final product is polished and clean. This increases the experience for the attendee and makes Mack’s message more easily understood. 3 – By pre-recording the webinar, Mack is free to interact with attendees during the webinar. This makes a BIG impression on attendees to have the speaker interacting with them live during the webinar. It increases attendee engagement and satisfaction. Want Mack to create raving fans for your brand’s webinar? Then email him today to reserve one of the four slots he’s reserved for webinars in 2017. Rates start at $2,000.00 per hour of finished content.